Y3685 Padre Pio 25 in. Y710 St. Jude 21 in. Y719 Angel on Cloud 10 in. Y718 Sitting Angel 10 in. M042 Winged Cherub 11 in. x 11 in. M025 Angel Stone 8 in. M047 Angel Plaque 12x6x1 in. R28 Madonna 3D 10Hx9 in. R11 Sacred Heart 13 in. R12 Jesus, Mary, Joseph 13 in. R13 Last Supper Plaque 9 x 15 in. R15 St. Joseph 13 in. R16 Mary - 13 in. 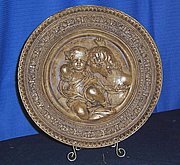 R17 Madonna Plaque 5.5 in. R21 Home Blessing 10 in. R26 Last Supper 3-D Sculptor 17 in. HD10 Angel Plate 10 in.